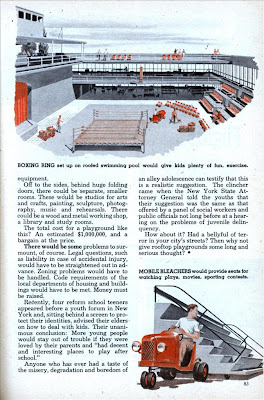 According the Mechanic Illustrated text, these somewhat utopian designs are planned for keeping kids off the streets and give them viable places for play that keeps them literally off the streets and out of trouble. It is an interesting social experiment, and there definitely have been some versions we've featured here at L+U... perhaps in certain circumstances, the need for recreation would make these viable. This was the idea, even back in 1957. From the text: "No miracles of engineering are needed. Technically, with the know-how we possess right now, no insurmountable problem exists. Declares Henry Kohler, a prominent New York architect who is editor of the Bulletin of the Brooklyn chapter of the American Institute of Architects: “Certainly it can be done. Even though roofs are of different heights, even though some buildings are narrower than others, there is no limit to the size of the playground which can be built. 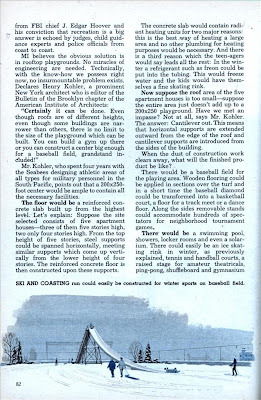 You can build a gym up there or you can construct a center big enough for a baseball field, grandstand included!" The use of the street is something of a cultural touchstone for urban and suburban play. Even in the relatively small community I grew up in, the street was heavily used for a number of uses by neighborhood kids - with the periodic moving for traffic or digging in a storm drain for an errant ball. 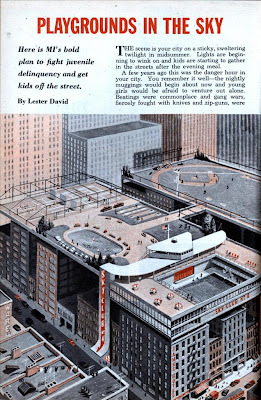 While not replacing the street, perhaps the roofs could augment and expand recreation - perhaps getting that kid to put down the X-box and pick up a ball. Need a bit more greenery though - even for a playground.